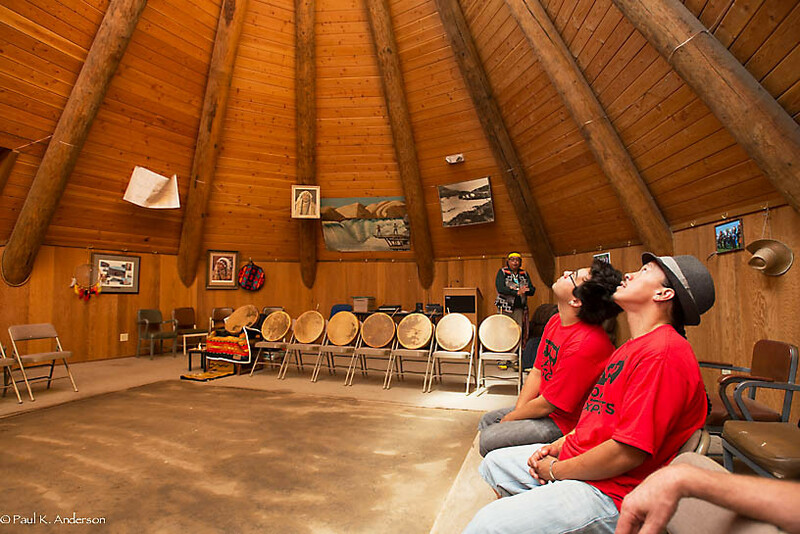 Inside a ceremonial longhouse in northern Oregon last September, the sun's rays spilling between the high-peaked beams, Davis Yellowash Washines was seated in full ceremonial dress -- yellow headband, red sash, beaded shoes. A rawhide drum rested in his hand, and to his left sat four teenage boys, each with his own drum and mallet. One wore a black Chevrolet T-shirt. They thumped their instruments and called out native songs as an organized smattering of young children bounced rhythmically counter-clockwise around the dirt floor. Two dozen fellow members of the tribal community, seated in folded metal chairs, looked on. "This longhouse is used for lots of occasions," Washines said between songs. "But this one is significant." This ceremony aimed to ward off coal. Celilo Indian Village, Ore., separated from the Columbia River by only a highway and some railroad tracks, is one of many tribal communities that sit in the path of what could soon become America's coal-export superhighway. If government agencies grant approval to three export terminals proposed for Oregon and Washington, up to 100 million metric tons of coal per year could soon be shuttled in open rail cars from mines in the Powder River Basin of Wyoming and Montana, along the shores of the Columbia River and the Puget Sound, and through ranches and reservations like this one. The coal would then be loaded onto ships destined for Asia's proliferating fleet of coal-fired power plants. Many activists currently fighting the plan see the impacts of burning coal on the global climate as their primary motivation. But for the Yakama, Lummi and other tribes, as well as communities in the path of these shipments, it's the local effects that worry them most. There are the potential traffic delays and disturbances to cultural sites. Then there's the very real prospect of toxic coal dust wafting off the passing trains, fouling the air, poisoning local waterways and even contaminating key food resources -- such as the salmon on which many local tribes, including those living in the tiny Celilo Indian Village, depend. While the U.S. has seen a steady decline in coal use in recent years thanks to tighter federal regulations and the expanded viability of natural gas and renewable energy, the rise of burgeoning, coal-hungry economies in China, India and other fast-developing nations means the Celilo tribes -- like many communities across the Pacific Northwest -- now find themselves wedged squarely between a domestic abundance of the combustible rock and its most promising international market. The potential expansion of coal exports elicits differing opinions among tribes and communities here. What may be an environmental or public health imposition for one is seen as a desperately needed opportunity for another. 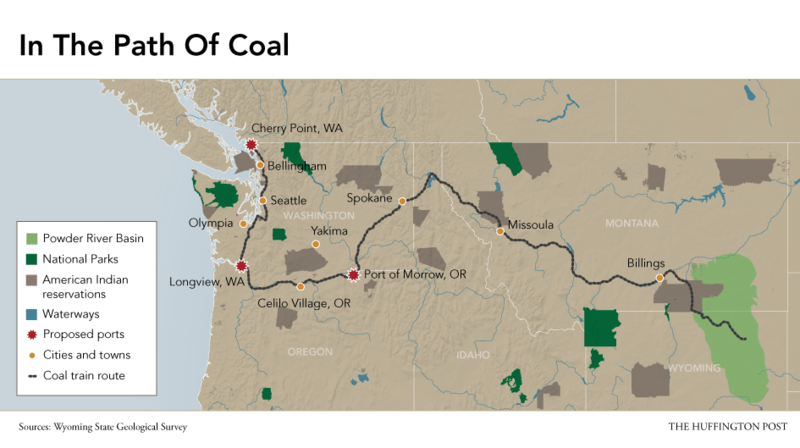 The coal industry, for example, argues that exports could inject welcome economic activity into struggling Northwest towns and reservations. By itself, the Gateway Pacific Terminal proposed at Cherry Point on the Puget Sound would add approximately 1,250 permanent jobs, including induced jobs such as restaurant and healthcare workers, as well as 4,400 temporary construction jobs, according to an analysis by an industry consultant. Annual local and state tax revenues would amount to about $11 million. The dispute over the coal trains is playing out in television advertisements, on the streets and inside boardrooms, town halls and courthouses from Washington, D.C., to Seattle. A series of hearings and protests over the last few months have attracted thousands of people -- some donning makeshift respirators, others wearing "Beyond Coal" T-shirts, and some even rappelling from a bridge over the Columbia River as a symbolic blockade to the shipments. Still, nowhere are the tensions so acute as on the hardscrabble reservations that either sit atop valuable coal -- an estimated 30 percent of U.S. coal reserves west of the Mississippi are located on native lands -- or lie in the path of the trains that would haul it to port. "Mother Earth doesn't have a voice," said Karen Jim Whitford, a tribal elder, as she stepped shoeless into the center of the longhouse floor. A couple of her tears disappeared into the dirt. "So we must speak for her." "I vote we stand up," exclaimed another elder, Lorintha Umtuch, referring to the totem's symbolic call for Native Americans to get off their knees and "Warrior Up!" for future generations. "Indian people need to stop this, or else corporations will trample us." Not all tribes stand on the same side of the coal-export battle line. CJ Stewart, a senator of the Crow Nation, said in a phone interview in October that his tribe desperately needs to develop its coal reserves to improve its economic fortunes and lift its people out of poverty. In November, the Crow Nation signed a joint resolution with the Navajo Nation in support of each other's coal development. "We rely on coal just as they rely on salmon," Stewart said, referring to the Yakama and other tribes represented in Celilo. "All tribes share one common enemy, and that enemy is poverty." Many tribes along the rail corridor, however, feel it's not just livelihoods at stake -- it's lives. Jewell Praying Wolf James, the carver of the well-traveled totem and member of the Lummi Nation, expressed sympathy with the coal-dependent tribes during a later stop on the totem's journey in Olympia, Wash. "We feel bad for the Crow Nation, the Navajo, the Hopi. That's all they got," he said. "But we want clean air, clean water. We want salmon restored and our children healthy." Dig into Native American history and you will strike coal. As far back as the 1300s, Hopi Indians in what is now the U.S. Southwest used the fossil fuel for cooking, heating and baking clay pottery. In the 1800s, Native Americans made up much of the early mining workforce that would help ignite coal's long reign as the go-to fuel source for the country's necessities and luxuries -- from transporting goods and running factories to heating homes and powering Playstations. But King Coal's grip is slipping. The rise of hydro-fracturing technology in recent years has unleashed torrents of natural gas, a cheaper and cleaner alternative, and left coal-rich states and undiversified coal companies with a serious revenue problem. Many have responded by looking to Asia, where mining local coal, in addition to building wind farms and solar panels, has not created nearly enough energy for the rapidly growing economies there. Asia's ready market and America's still plentiful coal could make a convenient marriage. Proving particularly attractive to Asian buyers is Powder River Basin coal, which is cheap to extract and relatively low in polluting sulfur. Yet plenty of obstacles remain in the U.S. and abroad before coal interests can successfully drive their product to northwestern ports for export. There are the vocal environmental advocates, the newly elected local leaders who've made clear their opposition to the plans, the big-money investors who've withdrawn support for port builders and, of course, the tribes. In a July letter to the Army Corps of Engineers, the federal agency tasked with evaluating the two Washington State coal port projects, the Lummi Nation wrote of its "unconditional and unequivocal opposition" to the terminal planned for Cherry Point, near its reservation. The tribe cited among other concerns "significant and unavoidable impacts and damage" to treaty rights reserved in the 19th century to fish at its "usual and accustomed" areas. Patricia Graesser, a spokeswoman with the Corps, acknowledged the Lummi letter and said her agency was in government-to-government discussions with the tribe. "We have a responsibility to uphold the nation's treaty with Native American tribes," she said. The Chinese government, meanwhile, is responding to a major air pollution crisis sparked largely by rapid development centered on coal-fired power. In December, Shanghai's air quality fell to a record low and the country's smog could be seen from space. But even with leaders in China vowing to slow down the growth of coal use, experts predict global coal consumption will jump up another 25 percent by the end of the decade. Decisions on the Northwest export terminals could significantly influence the future of coal in Asia. "Opening up this main line of cheap American coal is a pretty important signal if you are a Chinese official thinking about how much to invest in what kind of energy infrastructure," said KC Golden, senior policy adviser for the non-profit Climate Solutions, which has advocated against the proposed ports. The effects would span the globe. According to estimates by the Sightline Institute, a nonprofit think tank based in Seattle, Pacific Northwest coal exports could create greater national and worldwide environmental impacts, including on climate change, than a Canadian company's controversial proposal to ferry Albertan tar sands to the U.S. Gulf Coast via the Keystone XL pipeline. As Jewell Praying Wolf James put it: "Once the coal gets to China, it's pollution for all of us." For more than 11,000 years, Celilo Falls served as the center of trade and commerce for Native Americans of the West. The upwards of 15 million salmon that passed through the mile-long span of rocky chutes in the Columbia River every year functioned as a sort of currency. 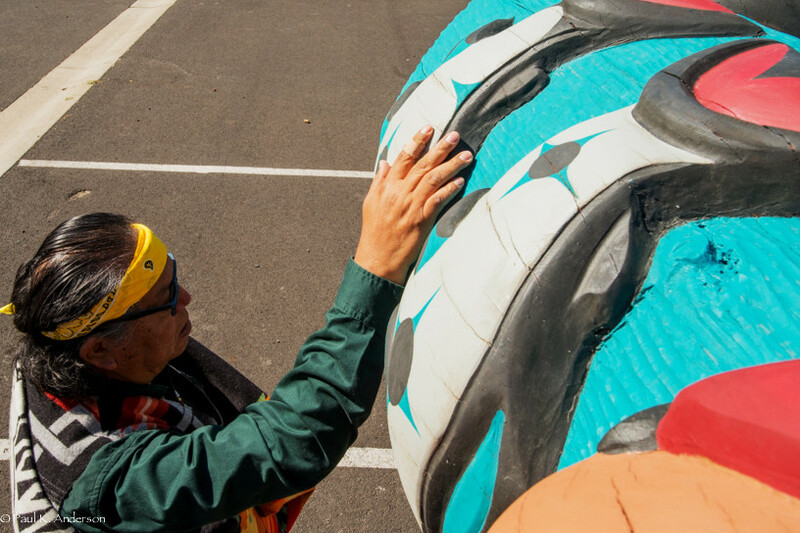 "Some tribal people call it pre-contact Wall Street," said Charles Hudson, intergovernmental affairs director with the Columbia River Inter-Tribal Fish Commission in Portland, Ore.
Lewis and Clark called it "the great mart." But within a few short hours on March 10, 1957, Celilo's era of plenty came to an abrupt end. Rising floodwaters from a newly completed hydroelectric dam engulfed the rapids. Salmon runs soon shrank to a small fraction of their former numbers. Davis Yellowash Washines, chief of enforcement for the Columbia River Inter-Tribal Fish Commission, was only 5 years old when the Dalles Dam opened and drowned Celilo Falls. "I can still feel its mist. I can still hear its thunder," he said over dinner the night before the September longhouse ceremony. Warren Spencer, a Yakama elder, was serving in the military in Germany that year, but he recalled the time-lapse photos of the inundation he received by mail from his mother back home in Celilo Falls. "I sat there on my bunk and cried," he said. Now, Spencer is deeply concerned about how this new energy project might affect the futures of his four children, 17 grandchildren and eight great-grandchildren. The coal push, he said, represents the continued encroachment of the federal government and "white man's money" on Native American tribes. "It's turning brother against brother," he said. Many of the current and former residents of Celilo belong to the Yakama Nation. Like the Lummi, the tribe put its opposition to the exports on paper. In a November letter to the Army Corps of Engineers and a state official, Yakama chairman Harry Smiskin referenced a "long history of Treaty violations from energy development in the region that permanently and irreparably have harmed my People." The new energy projects, he said, would add "direct adverse impacts" to the tribe's treaty rights to fish, hunt and gather food, and do more damage to the already fragile environment, culture and health of his nation. Dr. Frank James, of the University of Washington School of Public Health, underscored the "disproportionate impacts" of the coal projects facing native people of the Northwest. Much of this vulnerability results, he said, from their traditional dependence on the salmon of the region's rivers and coastal waters -- fish that are now widely listed as threatened or endangered under federal law and could be further spoiled by air and water pollution from mining and transporting the coal, and its burning overseas. The tribes' reliance on salmon goes beyond a staple food and a means to make a living. "It is their total way of life," said James. "Salmon is part of their religion, their culture, their language. To further impact that is an assault on their very existence." In a back corner of the Celilo longhouse kitchen, Gloria Jim sat in a folding chair, on a brief break from cooking the ceremony's Columbia River salmon lunch with other Celilo women. She lamented that they hadn’t had enough salmon to serve for breakfast, too. "That's how it used to be here," said Jim, who wore a white shirt printed with a picture of her deceased son, pink stretch pants and running shoes. She recalled the Forest Gump-like menu of her childhood: Salmon, fried or dried, stuffed or baked, or simply salted. "My mom didn't believe in food stamps. We lived on what we caught," she said. "Now we have no choice. We have to go to the grocery store." Her people have been warned, she added, that the salmon they do catch and eat may be dangerously polluted. An estimated 17 percent of pregnant Native American women already have mercury levels high enough to disrupt the healthy development of their babies -- much higher than other racial groups. Deposits of the neurotoxic heavy metal, along with arsenic and other contaminants from coal-fired power plants, can accumulate up the food chain and into salmon. Research further suggests that around 25 percent of the mercury in Northwest American waterways and up to 10 percent of the ozone in the region's skies is carried by wind currents across the Pacific -- from power plants in Asia. 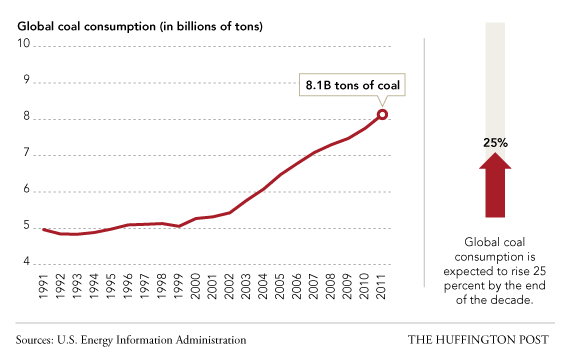 Coal exports could pollute the region in other ways. Perhaps most talked about are the risks of heavy metal-laden coal dust and diesel exhaust blown and belched from trains, terminals and ocean-going tankers. Derailments, such as the one that sent seven cars spilling coal into a British Columbia creek last week, raise further fears, as does the possibility of bunker fuel spills once tankers set out to sea through narrow, rough passages. In November, Dan Jaffe, an environmental scientist at the University of Washington-Bothell, released preliminary results of a study on the environmental insults of existing coal train traffic. His team monitored 450 passing trains -- some carrying coal, some not -- from two representative sites. They sampled for about 10 days at a spot on the Columbia River Gorge and for about a month near a Seattle home that butts up against railroad tracks currently used by trains en route to Canadian coal ports. Jaffe said he confirmed elevated levels of diesel exhaust there "on par with the dirtiest air in the Seattle area," as well as a slight increase in large airborne particles -- likely coal dust, he said -- when coal trains passed by. The three proposed terminals would dramatically increase rail traffic, bringing some 35 additional mile-plus-long trains in and out of the region every day. Currently, fewer than 10 coal trains come and go. Jaffe's crowdfunded research has yet to be peer-reviewed, a point emphasized by Courtney Wallace, a spokeswoman with Burlington Northern Santa Fe Railway, whose lines would host much of the westbound coal. Wallace added that BNSF has spent more than $1 billion on rail cars and locomotives that "achieve the highest EPA standards available," and result in 69 percent fewer diesel emissions compared to older locomotives. BNSF has testified that up to 645 pounds of coal dust can escape from each rail car during a 400-mile journey, but Wallace also pointed to findings by the railway that this fugitive dust diminishes as railcars travel farther from the Powder River Basin and toward export terminals. Several environmental organizations, including the Sierra Club, filed a lawsuit in July against BNSF over coal contamination of U.S. waterways. Wallace called the action a "publicity stunt," but a U.S. District judge denied a motion to dismiss the case this month. Blown coal dust and other hazards could be particularly dire around Celilo and the rest of the Columbia River Gorge, where train tracks are sometimes just feet from tribal residences, said Hudson, of the Columbia River Inter-Tribal Fish Commission. "The winds are reliable and strong -- 40, 50, 70 miles per hour," he said. "There's a reason it's the wind-surfing capital of the world." Located in rural Montana, the Crow Nation can't boast a lucrative seafood or wind-surfing tourism market. What they do have is a whole lot of coal. Approximately 9 billion tons of the fossil fuel lie beneath their land, comprising one of the largest coal reserves in the United States. "Coal is the way we've been taking care of our people," said CJ Stewart, the Crow senator. Yet his people continue to struggle with poverty and an unemployment rate he suggested is upwards of 50 percent. "And the U.S. cries over its 8 percent," he said. In June, the U.S. government approved a deal between the Crow and Cloud Peak Energy, a Wyoming company that's moving to increase its coal exports to Asian markets. The tribe now has the green light to lease its rights to an estimated 1.4 billion tons of coal, more than the U.S. consumes annually. The deal could be worth at least $10 million for the Crow over the first five years. Cloud Peak has also pledged to give preference in hiring, training and promotion to qualified Native Americans, as well as annual scholarships to local native students. A spokesman for Cloud Peak, Rick Curtsinger, said the company is continuing to work through an agreement with the tribe. 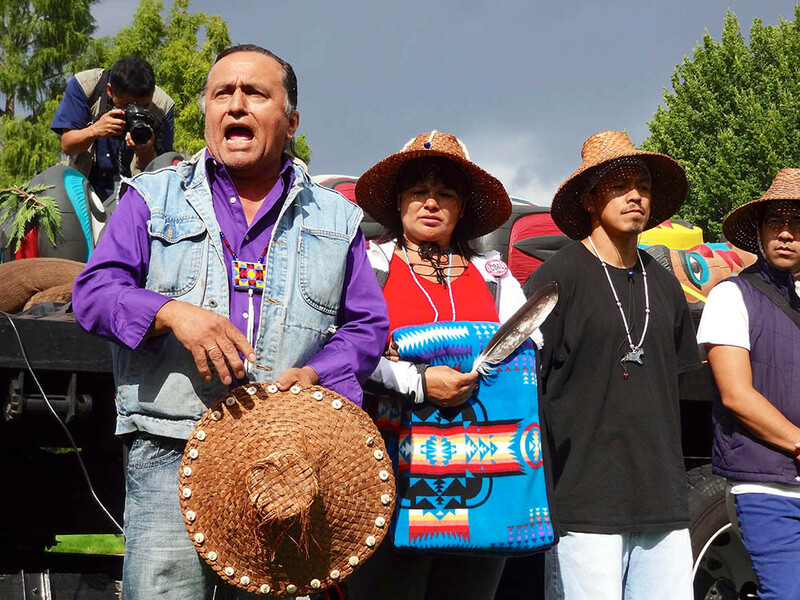 Crow Nation chairman Darrin Old Coyote testified in July before the U.S. House Committee on Natural Resources that the deal is largely dependent on the fate of coal exports through the Northwest. Such significant coal development, he said, has "unlimited potential to improve the ongoing substandard socioeconomic conditions of the Crow people and the surrounding communities in southeastern Montana." "Given our vast mineral resources, the Crow Nation can, and should, be self-sufficient," he said. Also in the heart of the Powder River Basin, and also saddled with high unemployment, are the Northern Cheyenne. The tribe has a long history of resisting coal development due to perceived environmental health risks. But like the Crow, the Northern Cheyenne are also recognizing an increasingly tough economic reality. "We've got a lot of coal underneath our land," said Tom Mexican Cheyenne, director of the Northern Cheyenne's community health department, who made clear that he did not speak for the tribe. "There's a split -- some on the tribal council are for coal mining and some are against it." The Northern Cheyenne's decision on whether or not to harvest their coal may, too, come down to pending verdicts on the Pacific Northwest ports. No train tracks currently run to their reservation's coal reserves, though rail lines could be expanded with enough demand. Mexican Cheyenne believes the council is leaning towards development of the coal. "I see a real desperation to help the economy any way they can," he said. Wind energy has also been on the table here for years. But impoverished tribes such as the Northern Cheyenne and the Crow often lack the funds necessary for capital investments and opportunities for outside help, such as tax credits. Debra Lekanoff, a leader with the Swinomish Tribe of Washington, said the tribes need federal support to find alternative ways to benefit from their resources. "We urge the federal government to help our brothers and sisters with funding, capacity-building and sound science to open up the doors to new opportunities," she said. She suggested that the "elephant in the room" in the coal development debate is the challenge of "walking in two worlds" and soundly balancing "economic sustainability and environmental protection." The Affiliated Tribes of Northwest Indians, which includes the Yakama and Lummi, adopted a resolution in September supporting a pilot project proposed by the Crow Nation to convert some of its coal to liquid fuels such as diesel and gasoline for domestic use. The tribe's plan, which Stewart said illustrates that the Crow are not entirely reliant on coal exports, also gained support from the National Congress of American Indians this fall. It still awaits federal approval. The official document from the Northwest Indians, however, notes that their blessing does not "supersede, replace, or rescind" a resolution made by the group in May that opposed all proposals to increase transportation through the region of "fossil energy," including both coal and unrefined crude oil. About a week after the resolution's adoption, Jewell Praying Wolf James's totem pole pulled up in front of the Washington state capitol building in Olympia for another event opposing coal exports. Much like the other stops on the totem's journey, this ceremony's songs and speeches pointed to both the despair and hopes of Native Americans and the deeply complex tensions at hand. A crowd of some 50 people, many representatives of local tribes, stood in the alternating rain and sun in front of the flatbed truck. Flanking the truck was a yard sign that read, "No coal exports. We can do better." Creating alternatives, experts agree, is prerequisite to combating climate change and sustaining resources for future generations -- and even to passing judgment on any group that chooses to develop its coal, or buy and burn it. "At the end of the day, we're not going to stop fossil-fuel dependency if we don't have an answer for how to create energy and create better lives," said KC Golden, the Climate Solutions policy adviser. "The Crow and other folks across the world want a fair shot at the relative prosperity we enjoy. We have to have a better answer than digging up half of Montana and burning it in Asia."